Lovely cover by Cliff Robinson with colours by Dylan Teague. There's a Droid Life cartoon. Dredd has an excellent opening episode. Judge Randy is the new man in town and the top job is up for grabs. Looks like a bit of a shake-up might be coming to the strip but I could be wrong. Brink has actually grown on me and the last few episodes have been pretty interesting. This week is actually quite spectacular. Skip Tracer. I always read the whole Prog, even the stories I'm not keen on, hence Brink growing on me. The difference with Skip Tracer is that we are now in a third series and it still does nothing for me. I will persevere. Tharg's 3hrillers - Keeper of Secrets. Very interesting first episode featuring horror and Cockneys'. Seems like a bit of a Clive Barker vibe going on here, in the art and writing, though I'm not sure that's actually the intention. Two of Clive's short stories sprang to mind - The Midnight Meat Train and one I can't remember the name of which featured the discovery of a burial site in London. Anyway, This is a good opener. Fiends of the Eastern Front. An action heavy episode to finish the current series. Look forward to it's return. There is a wonderful surprise in trade for older members of this forum. Hats off to Wagner for being so wonderful! Yeah, that's an amazing little nod. 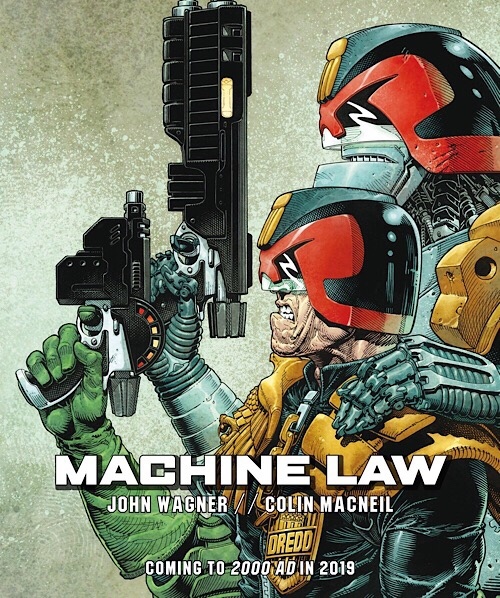 Even if the top job doesn't go that way eventually, it's lovely to see Dredd in favour of the possibility, and it feels very much like Wagner's own feelings coming through in Dredd and Hershey's summaries. 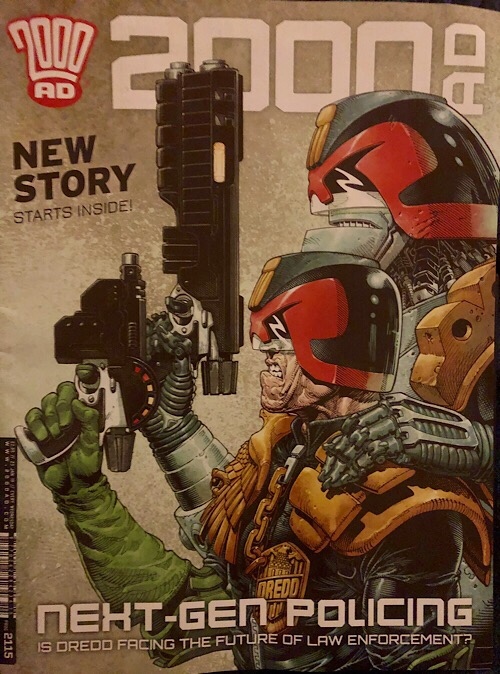 I'm very excited about where this Dredd story is going, not only because of the robots but also the other thing. A very promising 3riller, maybe because even if there wasn't going to be two more episodes the first episode would work perfectly well as a one-off Terror Tale. I think the 3rillers work best when they're told in distinct chapters like this, because then it feels like there's a reason for three episodes, instead of like one episode stretched into three. Brink and Droid Life good as always. Fiends was okay, but overshadowed by Brink and Dredd. I think I've had enough of Skip Tracer now. Makes all the difference having a strong Dredd story. Wagner's at the helm and things are happening - great cover too! As usual Brink is brilliant, Skip Tracer is not and Fiends is fun. Liking the Thriller, good art and an old school horror/thriller vibe to it. An image that does the artwork better justice. ...except then a certain Mr Wagner (J) rattles up, ably assisted by a one Mr MacNeil (C) just walks casually into the room, gives us all a knowing look, one that on the surface is casual and dismissive, but underneath has a cold clinical menace. He then drops a simply exquisite opening episode of Dredd like that. Two pages he draws the impact from Small House effortless into his world (making slight of those that assume he pays no heed of what others do in Dredd's world) its an absolute masterclass from both writer and artist. MacNeil's dark brooding art perfectly capturing the tension between these two titans. Then the switch to an action piece that simmers with tension and undercurrent. The high octane surface all exciting flash and action yet some how these two manage to weave an hidden sense that something is wrong, very wrong. Just wonderful. ...oh well except nothing really. I mean that's hardly a surprise given how good those two are and Fiends ends with a whambang that is quite brilliantly good fun and Skip Tracer tries to remind us what made last time so much fun AND the 3riller layers on the mystery all be it a little too thickly and doesn't yet give us enough to actually get our teeth into but its an okay start... and did anyone else think there was hints of John Ridgway about Steve Austin's art at times? So that’s a “Eraser-crumb flicker” droid in Droid Life. Which is not what I thought I read the first time. Machine Law starts promisingly. Brink remains excellent. I thought Bridget was off Nudge? Or am I misremembering the first series. The 3riller starts with a bang. Maybe the highlight of the prog? I like the direction Edginton is taking Fiends and am looking forward to the next series. Dredd - effortlessly brilliant. There's just so much in those first two pages. And Brink's not too far behind. Those 2 are worth the price of admission alone. Frankly, there's no real way this can be avoided now, unless Wagner is writing one-offs that don't play into continuity at all. It's one thing if you're the effective show runner; it's another entirely if you've decided to take a step back and just go for the equivalent of guest appearances in a strip, leaving others to dictate its future direction. Whichever way you take it (and as a critic of The Small House) it's good to see it being fairly seamless - Hershey taking the current Council out of the running works with regards SH as well. Even though Wagner has no official veto or control overt other stories, if he writes a change of chief judge, then (to paraphrase someone) who the hell's going to mess with that? In the absence of Carlos, Wagner & MacNeil on Dredd is just about perfection. Great first episode, hope this doesn't end too quickly. Brink - still awesome, 'nuff said. I think it was mentioned when she started the undercover job that she'd have to start consuming nudge again as she had no choice working in that job. Skip Tracer - nah, it's competent enough but there are no ideas or characters that I feel I haven't seen a hundred times before. Good opening to the 3hriller - remains to be seen whether this will have any interesting twists or be just another generic paranormal investigator story. Fiends is okay, but I feel that the core concept of the Fiends franchise has been bent towards including Black Max, a character I have no knowledge of nostalgia for. I hope they don't let the Comics Treasury acquisition go to their heads and start peppering every story with contrived crossovers with rebooted classic characters. A middling prog then, a little too much by-the-numbers stuff going on with minimal levels of thrillpower, but Dredd elevates it.